The drawing that the prints are going to look like. 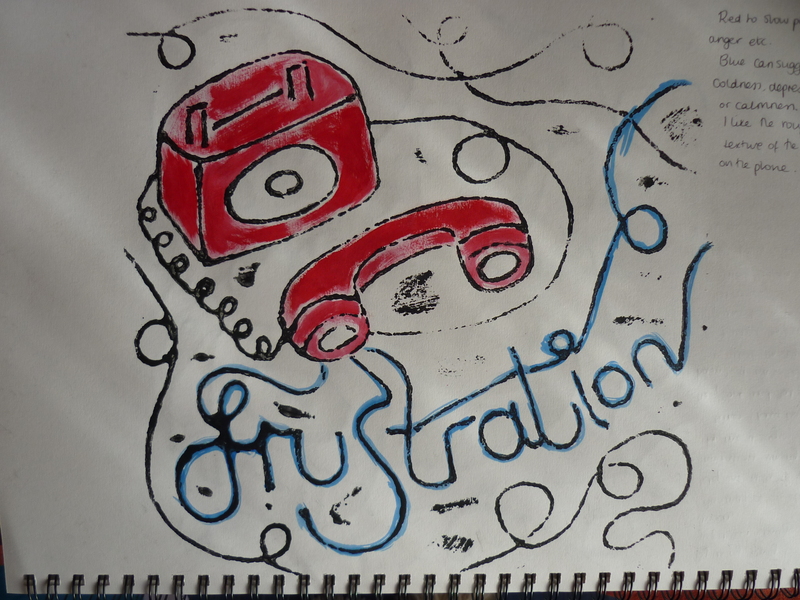 An old telephone that is on the floor with the words frustration coming out of it. I wanted to suggest the feeling when someone is on the phone to you and they aren’t listening to what your saying or if they want help but everything you suggest is wrong. That feeling of frustration and annoyance and all you want to do is to put the phone down on them but you can’t because then you would be the one who would be classed as rude or mean. 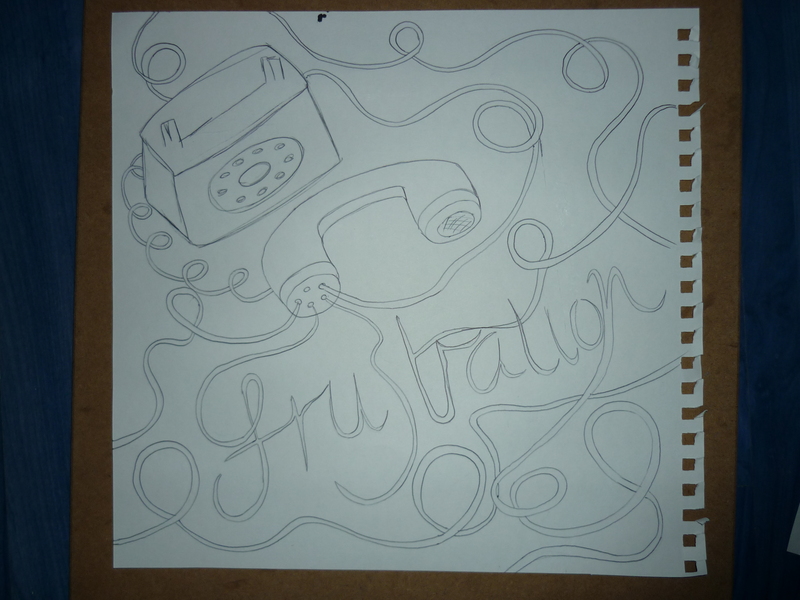 Well this is what I tried to illustrate with the words flowing through creating the keyword. 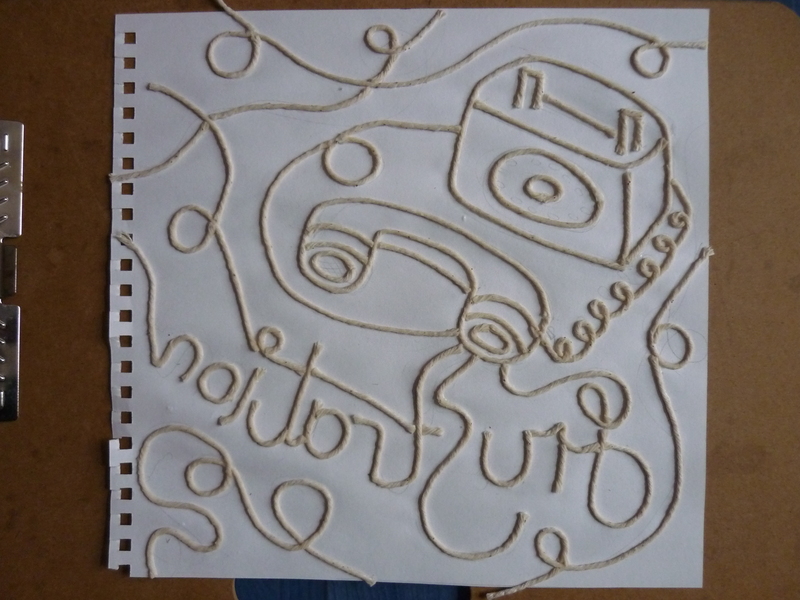 When I first drew it out I thought yes all I need to do is to add the string, however I remembered luckily before I started that the letters will come out back to front and so I had to re draw my sketch but backwards. That is easier said than done! The final string piece that I am going to use to print. Anyway, I did it and ta daa! The strings are glued on using ova glue and everything is nice and backwards. It took me most of my day which I was quite surprised about because I thought it would take only a couple of hours. I am testing some string techniques, which works best; string that is glued down and overlapping or sting that has been cut not to overlap but still makes the loop. I hope that makes sense! I had to leave it overnight to dry because I painted the whole piece with watered down pva so the paint isn’t absorbed so much into the string. 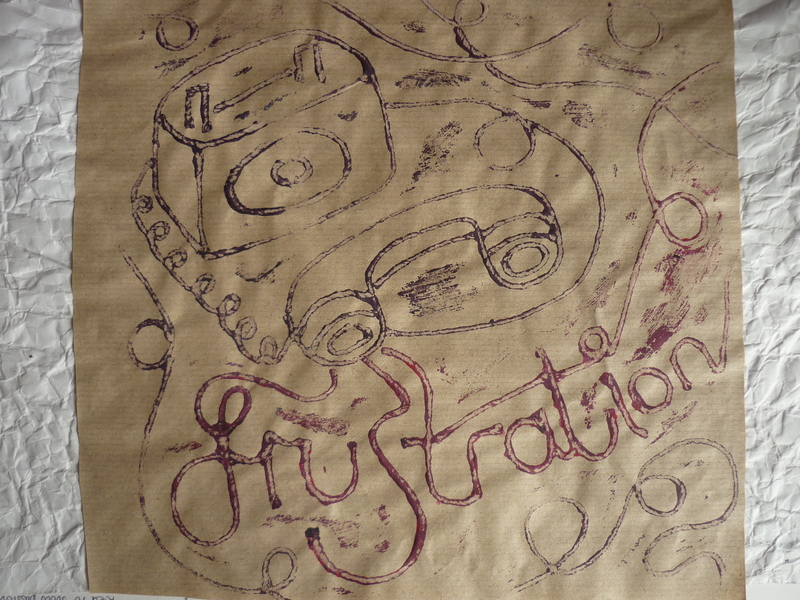 Deep red and purple printed onto brown paper. This isn’t my first print as the first one was just black paint on white paper, I thought I would post the more interesting ones. 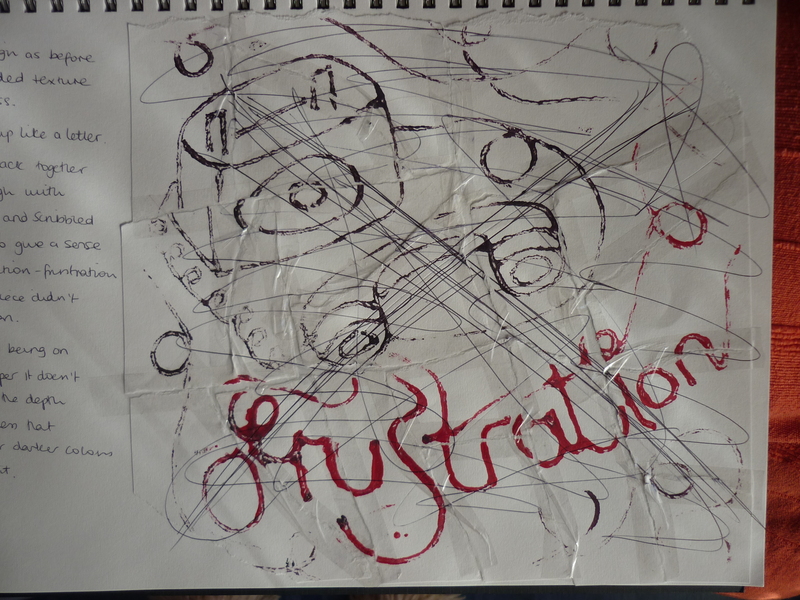 When researching into which colours best suit the word frustration, deep purple and red came up a lot and so I used these two colours to create an unusual piece of work. 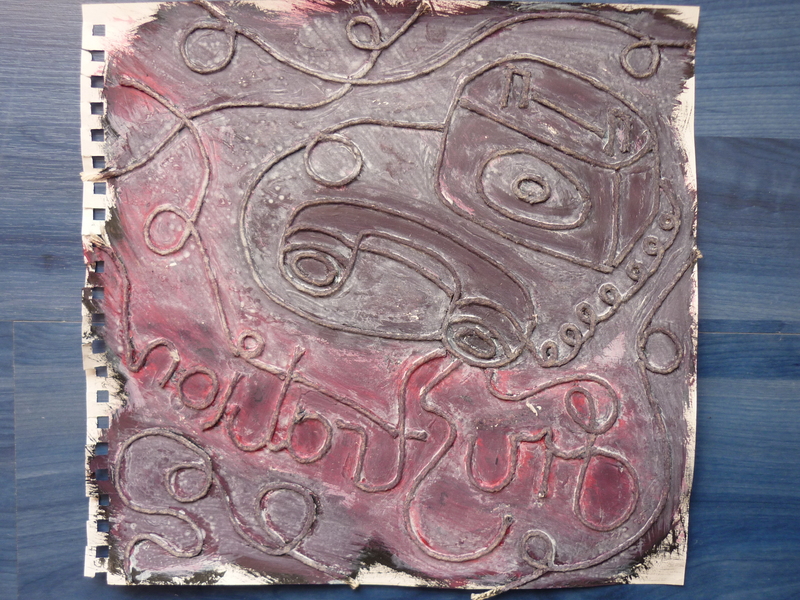 I printed onto brown paper just to see what it would look like; I put the red on the text and purple on the phone as I wanted the text to stand out more. You can see the string pattern which I was pleased about as it gives texture even though I painted over the string with glue. I like the piece with the accidental paint scraped between the string but I feel like it doesn’t show the emotion off well, it just looks like a nice colourful print. Black Print with coloured acrylics painted on top. This is one of the black and white prints and I thought it looked a bit dull and so I painted onto of it using acrylic. Limiting myself to only using two bold colours I thought it would create a bright image. Red for the phone to show maybe heat or passion that is being said through the phone; blue for the text. I chose blue so it was a high contrast to the red and I only used it on the text so the image wasn’t overpowered by colours. However, I feel like the blue is too calming and not frustrated enough – maybe I should have used a burnt deep orange or a deep purple. 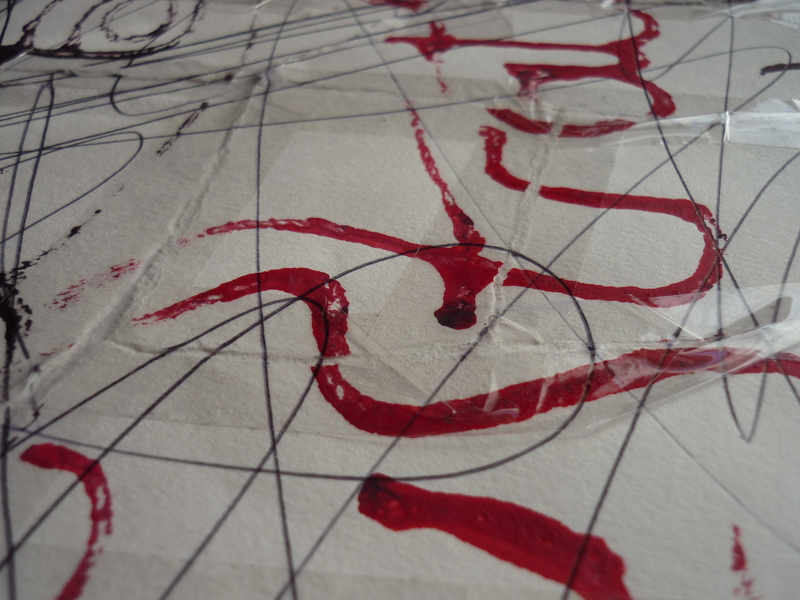 Torn, scribbled on and cellotaped back together. In my past research I noticed that repetition of lines and lots of textures usually create the best sense of frustration. So for this print I tore up the work (I’m also trying to let go of the attachment and defence I have over a piece of work) I thought when some people become frustrated they tare things up but then realise they shouldn’t have done that so they try and make it better and stick it back together. So this is what I did, using cellotape and scribbling all over it before putting it back together. I think this has more of a connection to the word compared to the previous prints however, I still feel like there is something wrong – not communicating well enough. I think it’s because of the whiteness of the the pieces, clean calming white – maybe I need to make it darker or added a texture to the white background. Close up of the texture and materials I have used on this piece. This is what the tool I used to create the printed images look like. Rough and textured I really like it, it looks like it has gone through a lot and looks better than most of the printed pieces! With layers of paint all over and a scratchy white on top it looks alright, ashamed the words are backwards, or is that a good thing? I’m definitely going to keep it to use it again or just for its own personal look. I didn’t want to lose any practice on my own original style, I placed the original drawing into photoshop and created this. It has a totally different feel and texture compared to the rawness of the printed images. This is clean and crisp which I kind of like, using similar colours to before red and blues. 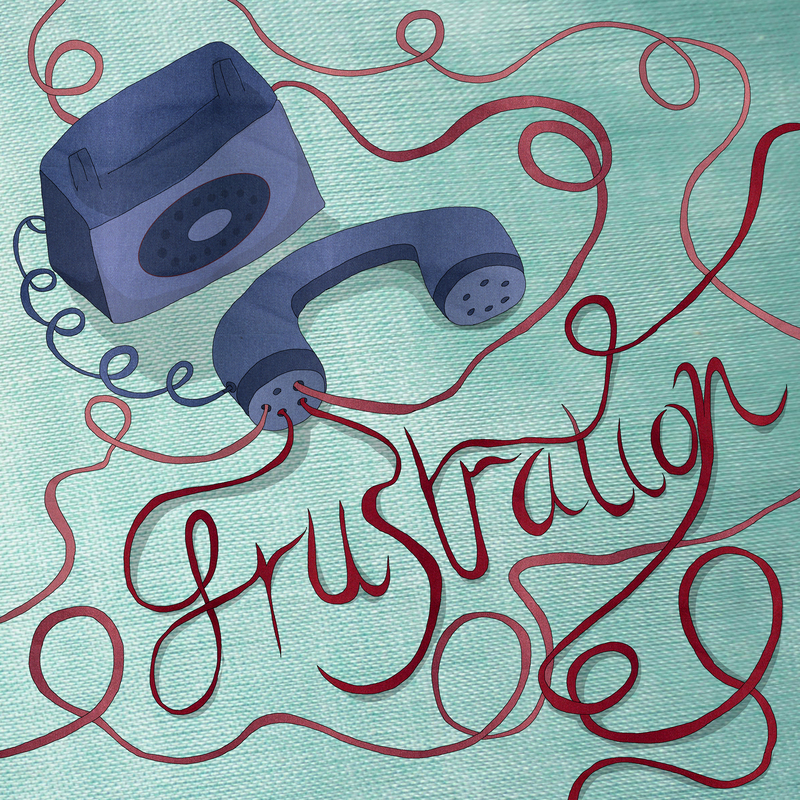 I chose blue for the phone so the red hot frustration oozes out of the phone speaker. Making the text slightly darker so it stands out more and the background colour is a bluey green so it doesn’t clash too much. I am trying to make colours stand out in my work as before they started to get a bit wishy washy and neutral. To the testing before about the string overlapping – I can’t see much different to be honest, as long as the string when it overlaps doesn’t stick out too much so the rest of the string doesn’t reach the paper then it will be fine. I am glad that I had ago at this as it makes me realise that you can get more textures and feel to the work by using raw material instead of using scanned in material on photoshop all the time. I will be definitely experimenting more with materials more in the future as I still can use the texture in photoshop in other projects. This entry was posted in Having a bit of fun.